Home / community, events, play, zero to three / WONDERful. Wildflowers and Lullabies. 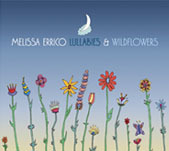 Melissa Errico, a dear friend to Swellbeing, has poured her large and generous heart into her latest album, Wildflowers & Lullabies. Melissa has described this project as a series of love songs to her darling daughter. As a mother who is smitten with her daughter, I can wholly appreciate the power of the love behind this kind of expression. If only we all were blessed with such beautiful, perfect voices! Melissa is a broadway actress, solo artist and founder of Bowery Babes. Bowery Babes is easily the most impressive grassroots mothers group I’ve ever had the privilege to witness. Melissa started this group in her prenatal yoga class. The Bowery Babes, originally 12 members strong, now has four ‘sister’ groups/generations and 300 families. This group gets to the heart of women not feeling alone. Women making New York a sweeter place in this sweetest of times. Friendships and a shoulder to cry on, a real mothers support network. Join me in supporting this great art coming from a pure maternal place. The album is available today at Amazon and would be beautiful background music for your Mother’s Day!